Building on over 16 years’ experience across all types of tree services, Canopy Tree is well-equipped to assist you with all your possum prevention and control needs. A protected species, possums feed on leaves, buds, flowers and fruit to survive. 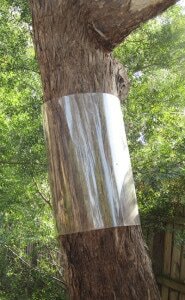 In order to protect your gardens and property from the possums without endangering them, Canopy Tree can install sheet steel collar barriers around tree trunks and stems to prevent the little creatures from climbing for access to your house or collecting your favourite fruit. To effectively control the threat, these tree guards and/or bands will be installed on all adjacent trees in the area that may be at risk. We can also use possum netting around whole trees such as fruit trees and date palms which will also prevent bats and other creatures from nesting or eating the fruit. To find out more about our possum barriers / possum tree guards and netting services, please contact Canopy Tree Services Sydney & the Southern Highlands today!